The first thing that people will tell you about London is that it's expensive. Between the exchange rate, going out, and if you're like me and can't walk by a gelato shop without walking in, get ready to spend some serious money. 1. London is expensive- save money. The first thing that people will tell you about London is that it's expensive. Between the exchange rate, going out and if you're like me and can't walk by a gelato shop without walking in get ready to spend some serious money. Before you go try to save up as much money as you can because whatever you think you're going to spend, you'll probably spend more. Things like a security deposit, buying books or forgetting something small will add up. And of course you want to have a little fun while you're here too! 2. Show your student ID. Showing a student card can get you discounts at retail stores, restaurants and clubs. In terms of going out in London, most places have a cover charge but there are ways around it! For a lot of places, something as simple as adding your email address to a mailing list will get you free entry! Also, many bars and clubs have free cover if you go earlier before it gets crowded. You might be the first ones there but after seeing the cover charge add up over the weeks you won't mind after a while. 3. Get an Oyster Card. One of the best student discounts London offers is the oyster card. It is a discounted card for the London Underground System. I thought that I would hate taking the tube to class everyday but it is essential to getting around London. A student rate for a monthly unlimited pass is about £80 and it will pay for itself in about a week. Almost everywhere is accessible by the tube so this card will become your new best friend. 4. Don't let the weather/being lazy spoil your plans. It's easy to let the weather or the excuse of a lazy Sunday intimidate you from going through with plans you may have had. Some days you'll be tempted to stay in and watch tv or movies but there's so much to do in the city it's important to force yourself to get out. 5. Apps to get. There are a bunch of apps to get that will make your time in London a whole lot easier, whether for staying in touch finding a restaurant or catching a cab. • Whatsapp is for texting. Download these two apps before you go as they will send you a confirmation email to register. • Citymapper tells you how to get to any address via the tube, bus or walking. This app has been a lifesaver! • Hailo finds cabs nearby and allows you to pay for in through the app with a credit card if you're running low on cash. • Tripadviser lists the top attractions and will give basic info like how much it costs, the hours and a general description. • Zomato uses your location to find restaurants in your area. When looking for places on a budget it's a lot easier than walking the streets and settling on a place out of hunger. • WeHostels If you're heading off exploring for the weekend, check out this easy to use app to find affordable accommodations. It's easy to use on the go with great reviews of concerts and festivals. 6. Pub life. If you want to meet local British people your best bet is to go to the quintessential London pub. You will see people out drinking at pubs at noon and all throughout the day. With the lack of open containers laws at night people will linger outside of pubs spilling onto sidewalks and the street. Throughout the week, pubs are the place to be. Also, by going to bars and pubs by local British universities you can ensure you will meet British people your own age. 7. Commit yourself to a football team. You might not be a fan of a particular team before you come but you will be by the time you leave. Even if you don't go to a game, watching one at a pub with friends and cheering on your team can be a great way to experience London culture. I was able to take a tour of the Chelsea football team stadium, locker room and press room through a school trip so now I have dedicated myself to Chelsea. GO BLUES! 8. Walk a new way home everyday. This tip was told to me by one of my flat mates' brother who studied abroad in London a few years ago but I liked it so much I am passing it on. By walking a new way home, to class, to a different tube stop or even just walking to walk, you pay more attention to your surroundings. By walking places, you'll see more of different areas or neighborhoods and find hidden spots you may want to go back to. 9. It's okay to be a tourist. The London Eye, Tower Bridge, Big Ben etc. are sights that you need to see. What's great about London is that many of the sights are free. Most of the museums and main sights you can see for free and if not, that student card I mentioned before can get you in at a discount rate. London has a history dating back over 2000 years, there's so much to see that no one should miss! 10. Do all the touristy stuff right when you get here. When you first get to London everything is new and exciting and you'll be motivated to take it all in right away. The longer you let pass, the less likely you'll be to go out and see the city. Within the first few weeks of getting here, go out and see all the cliche stuff. You can always go back another time too but don't leave London without seeing all the major attractions! 11. Write down your experiences. This one may seem corny but it's a good idea to write down the places you go or travel to, what you see and how you're feeling throughout your abroad experience. You're going to want to be able to look back and remember everything you did. Whether you write in a journal, a word document or go as far as to write a blog to share with others, you'll be happy you have it to look back on. Better yet, share your experience with the College Tourist. Create an author's profile here. 12. Force yourself to take pictures. I am not a person who usually takes pictures but since being abroad I have tried to force myself to document everything I see and do. As a general rule, if you think you've taken enough pictures, take more. That way, you'll guarantee you have at least one good photo from everywhere you go. You might think you're taking way too many but you'll be happy you did when you have good pictures to show from your travels. 13. Do whatever it takes not to get sick. As someone who gets strep throat roughly 5 times a year getting sick while abroad was something I was extremely concerned about. Now that I am settled into my triple room in a small 6 person flat, getting sick is even more of a concern. Take some vitamin C, keep your room tidy, wash your hands. Being sick is bad enough at home, even worse at college and one of the worst things that could happen abroad. Make sure your medical coverage is up to date and you have the paperwork handy. 14. Take at least one class that forces you out of the classroom. Most universities will offer a few classes each semester that are purely focused on getting students out of the classroom and out into the city. If you're lucky enough to have flexible class requirements where these classes can fit your schedule they're a great way to get class credit and see more of London. If you aren't able to take one of these classes, most professors understand that by studying in London students are looking for a different kind of learning than being just in the classroom. Professors will organize class trips or bring in a variety of guest speakers to spice up the traditional learning experience. 15. Take advantage of school sponsored trips. By going abroad through Syracuse University at their London center, many school sponsored trips come included in the program fee. Taking advantage of these trips is a great way to see places you may not see otherwise. For example Greenwich Market, Oxford University and Bleinheim Palace are places I maybe would not have seen without the trip being offered to me. 16. Bring an umbrella. As you've probably heard, it rains in London. This isn't mind blowing travel tip but a good piece of advice would be to invest in a small, compact sized umbrella. It's easy to keep in your bag or purse and when it comes to London weather, it could be raining one second and sunny the next. This way you'll never be caught in a freak storm sopping wet and end up with an "I love London" umbrella in a case of emergency. 17. Buy experiences, not things. It's a great thing to think of when you're planning how to spend your time and money. You will have a much fuller abroad experience if you spend your money on tours, traveling and trying new places and foods. You'll remember far more the experiences you have over a sweater or t-shirt you might want to buy. 18. Call your credit card company before you leave. This is a must do! Call your bank and credit card company a few days before you leave and tell them you will be out of the country. Tell them the day you leave and the day you will be returning. The thing about ATM's eating cards actually happens so don't think it won't happen to you. Also, if you're planning on traveling to any other countries while abroad let them know of any places you are even considering going. This way your card won't be taken while withdrawing money in a possibly non English speaking country with a phone that can only make calls in the UK. 19. Choose your bank carefully. Also, before you even call you're bank make sure you have one that is compatible with traveling abroad. As for London, Bank of America has a deal with Barclays Bank, one of the biggest banks over here. Since they have an international arrangement you won't get charged a transaction fee when taking out money. It's a good idea to look into any banks that may work with your home bank in order to avoid racking up charges whenever you try to take out money. For example, Bank of America has a travel rewards card that does not charge you international foreign exchange fees. 20. Avoid fomo. Oh the dreaded Fear Of Missing Out. It's easy to feed into being homesick or schoolsick (is that a thing?) while being abroad but it's best not to feed into it. The worst thing you can do if you're missing people from home is sit at home all day and Facebook stalk or message them. Refreshing your newsfeed constantly is only going to make you feel worse. It's better to get out there and do things instead of dwelling on not being home. Remember you're in a foreign country and doing cooler things anyway! 21. Beware of Pick Pocketers. Luckily, I haven't had an issue with pick pocketers thus far but that doesn't mean they don't exist. I have heard of people getting their iPhones, rings and wallets stolen. How to avoid pick pocketers? Always be mindful. When riding the tube (especially during heavy travel times) keep your purse and all the contents zipped and close to your body. My friends iPhones was stolen right out of her pocket. Also, when eating at restaurants, particularly outside ones, keep your bag on your lap or on the side of the table not exposed to people walking. It is so easy for someone to slip your purse off the back of your chair or open it without you noticing. 22. The art of a 'to-go' lunch. Everyday around 1 o'clock the London streets will fill with students, business men and women and people from all walks of life going out for lunch. This is something that I have noticed here more so than any city I have been to. Streets are lined with sandwich shops, sushi and anything else you could think of that is easily put in a to-go container. Also, grocery stores here have sandwiches and salads that rival any sandwich shop you could think of. This gives you an endless variety of lunch options. 24. Explore markets. Some of the best shopping (and eating) in London can be found at markets. On the weekends, people flock to various markets and spend the day walking from shop to shop and trying different cart food; you can get anything from crepes to meat pies. Some of the popular markets are Camden, Portobello and Borough, all of which are only a tube ride away. See more on the London Markets here. 25. Don't bring rain boots. You might be thinking how can I go to London and not bring rain boots?! But trust me they're not worth it. Not only do they take up a lot of space and weight (damn 50 lb. weight limit) but you won't wear them nearly as much as you think you will. Instead, bring shoes that you'll get the most use out of and that you could walk a lot in if necessary. 26. Drink like a Londoner. Something that has become a staple part of my diet is cider. You may be thinking of apple picking and drinking hot apple cider but this cider is in an entirely different form. Aka its alcohol. Here, cider is an alcoholic beverage with a lighter taste than beer which often comes in many different flavors like regular (apple), peach, pear or strawberry-lime. You can find it anywhere from bars to your local grocery store. People talk about reverse culture shock when returning home and I can already tell I will attribute mine to the lack of accessibility to cider. (Yes, this made the list of 50 things you should know about London, Try Cider!). 27. Send postcards. So far, I have sent postcards to family members from the two countries I have visited. Not only was it a way to remember all the things I had done and seen immediately after doing them (use them as a way to kill time in the airport). Not only is it another way to reflect on your experiences abroad but your family members will appreciate hearing from you in a personal way. An easy way to send postcards is with the Postagram app. It uses your own photos and you can send a real hardcopy postcard to your family right from you phone. 28. Watch BBC News. Even if you're not one to typically watch the news at home turning on the BBC for an hour a day or even just while you eat breakfast is extremely beneficial. It's important to get a foreign perspective and see how differently news is presented at home versus in such a multicultural city like London. Also, by having a television in the UK you automatically pay a subscription fee for the BBC to get better programming and no commercials so you might as well take advantage of it. 29. Check bus routes home before you go out. One annoying thing about London is how early the tube closes. Since the tube is the fastest and easiest way to get around it's a shame it's only open until 12:30 am. The other way of getting home via public transport after a night out is the night bus. Unless you're willing to pay for a cab every time it's worth learning the night bus schedule. In my case, there are only two buses that take me close to my flat so knowing where these bus stops are is vital. If you know where you're going out you can look up where the closest bus is and how to get there. Taking the night bus isn't hard once you get the route down and it can be fun when there are lots of people on the double decker buses. 30. Book travel plans early. Figuring out where you want to travel while abroad is a daunting task. There are so many places to go and only a short amount of time. Having a balance of weekends traveling and weekends in London is key. Figure out where you want to go early on so you can book hotels, hostels, flights and trains early to get the cheapest prices. That way you won't end up breaking the bank. 32. Bring only a backpack when traveling. The best and easiest way to travel around Europe, especially if you're utilizing cheaper airline carriers, is with only a backpack or small carry-on item. My North Face backpack has been my savior thus far. You need a lot less than you think so try to pack as efficiently as possible. If you have even a small bag/purse with you in addition to your one bag some cheaper airline carriers will try to charge you, so make sure you can stuff it in to your larger item. 33. Buy straighteners/electronics here. One thing you definitely don't want to have happen while over here is your hair dryer or straightener to blow up and blow out the outlet. I've also heard of people ruining their converters by using something that requires more voltage than the converter can take. Buying small electronics in the UK is not a huge investment to make and will save you a lot of headache. When it comes to the hair supplies, any Boots drugstore will probably have a small one that will do the trick for the time you're abroad. 34. Bring your own converters. One thing you shouldn't wait to buy over here is a converter. You'll probably want to charge your phone right away to check in with parents, friends etc. So having a way to charge it without running around from store to store buying whatever converter you can get your hands on is key. The converter I got I found at Target. What's good about the one I got is that it came with the converters for every different outlet you could encounter around Europe, each labeled accordingly. I would highly suggest this if you plan on going places that don't have the UK 3 prong outlet. This way you won't be in a jam in the Munich airport dropping 25 euros on a converter for 3 days (true story). 35. Change currency beforehand. You might not get the best exchange rate but make sure you at least leave the airport with a few pounds in hand. I unexpectedly had to take a cab on my first day here and was so happy I changed all my US dollars over in Heathrow airport. You don't have to come over with a lot but you don't want to end up stuck in a bad situation. A handy currency converter to have on your phone is XEcurrency. 36. Oh you fancy, huh? Bring dressy clothes! If you're planning on going out to any of the major clubs in London you have to dress to impress. Girls: heels only. Seriously they will turn you away if you are not in heels. Dresses and skirts are appropriate for girls but try to dress more conservatively. Guys: you may want to bring a jacket with you for going to nicer venues. If not a jacket, definitely dress pants and dress shoes when you're trying out the club scene. 37. Put your email on your luggage tags. This is a tip that was given to me before I left that I never would have thought of otherwise. Most of you will probably already have family luggage tags on the suitcases you'll be bringing over but it's important to update all of that information. My bags ended up on the plane after mine and got delivered to my hotel luckily because I had updated all of my information. Make sure to put your dorm/flat address or school address on the tag; anywhere really that you know will be accepting packages for you in the UK. Another thing you would normally put on a luggage tag is your phone number... which news flash won't work once you land. You can aslo put your email address on the tag, that way if you can be reached immediately. 38. Don't be afraid to ask locals for suggestions. One of the best things you can do to find cool places to go out, eat and explore is to ask locals. This can be anyone you meet at a store, a coffee shop or even out. Ask them for what their favorite places to go are and you'll get a variety of places ranging from casual pubs to clubs open until 6 am. Everyone we encountered was happy to give suggestions and like telling us why he/she enjoyed it. 39. Don't expect water or free bread at dinner automatically. One thing that will shock you is how little water people drink over here. Make sure that when you ask for water at a restaurant you specify you would like tap water. Otherwise they may bring over a full bottle of still or sparkling water which could add about 5 pounds to your bill. Another trap you could get yourself into when ordering at a restaurant is ordering bread. Bread here is not a complimentary item that automatically comes with your meal so be mindful. Combine bread and bottled water and you could pay around 10 pounds for items you didn't even want. 40. Tipping. The general etiquette of tipping stands in London with a customary tip between 10-15%, however restaurants may apply a service charge of 12.5% to you bill so make sure to check the bill before you leave a tip. In bars and pubs without table service, tipping is not expected. The standard practice with taxis is to round up the fair. 41. Don't take minicabs. This is something that will probably be drilled into your head by whatever program you are studying through but one early reminder won't hurt. The traditional London black taxis are the best and safest way to take a taxi in London. All London taxi drivers are required to go through an extensive certification process to know where any address in London is. They are also licensed so you can be sure you are taking a safe way home. Unlicensed minicabs drivers do not have any certification and do not need to register your travel plans. So, no one else is aware of your travel plans with them. It is extremely unsafe and is a way for many abductions to happen. There's no need to be afraid, just stick to the London taxis you've probably seen in all the movies and you'll find yourself home safe and sound. 42. Triple look both ways when you cross the street. Something that will take some time to get used to (still getting used to it) is that they drive on the other side of the road. When you're crossing the street triple look both ways before you cross. Yes, channel your inner 3 year old and look right, left and right again. You'll be happy you did when you're not the one getting almost run over on a daily basis. 43. Branch out. Whether you're going abroad with people you knew from home or completely on your own it's important to branch out. People who you thought you might not have had anything in common with at home you automatically have something in common with here. The fact alone that you are living in a new country on your own gives you something in common. Meeting new people, even if they go to your school at home, is a great way to make your abroad experience even more worthwhile. 44. Buy shower products/makeup beforehand. Even though it was not hard to find a place to buy toiletries upon arrival, in retrospect I wish I had just brought it with me. Not only do you end up paying more for these items in pounds it is not a guarantee that you will find the same brands or products you are used to at home. As a general rule, if there is a particular product you cannot live without out just bring it, but be selective and don't bring your entire bathroom cabinet with you. What I did bring was travel sized bottles of everything to bring on trips with me. I found this easier than filling travel bottles and an easy way to make airport security go by faster. 45. Go to a Show. London is a city with vast theatre opportunities. If your schedule is flexible you can great day-of tickets especially at a student rate. With over 40 theatre locations in the West End alone, there is always a show available to see, something everyone should take advantage of while being in London! 46. Go out earlier. You might be surprised to find out that most places close a lot earlier than you might expect. Pubs for instance close at midnight or 12:30 am. If you're looking for an early night then pubs is the way to go. That way you can also make it home before the tube closes at 12:30 am. Bars and clubs are open much later but getting there early is crucial. Not only will you be waiting in the queue, or line, for a long time but you may also not get in. And as mentioned previously, the earlier you go the cheaper it is. It'll take some time to get used to but going out earlier is always better. 47. Take advantage of duty free shops in airports. Buying more expensive items like high end beauty or apparel items is always cheaper in the duty free shops at the airport. If you're looking to kill time this is a great way to do it. Not only can you take advantage of the duty free but depending on where you are you may be able to pay in euros instead of pounds, which has a much better conversion rate to the US. You can buy things from alcohol and souvenirs to MAC products and Gucci sunglasses. If you're planning on buying some of these items anyways doing it on your return back from a trip is a good thing to keep in mind. 48. Discount Shopping. Not everything in London is expensive! There are stores that are devoted to having the lowest costs possible. Primark, which you won't be able to miss located directly on Oxford Street, has very inexpensive clothing and shoes for men and women as well as household items. Here's another tip: if you forget to bring a towel abroad (like me) go here! Another place to buy cheap items is Poundland, the UK equivalent to the Dollar Store but better. Many of our household items like dish rags, soap and sponges we found at Poundland, along with school supplies, toothpaste and most importantly Nutella. Another suggestion I would make is changing your Groupon location to the UK. They have great deals on pub crawls, gym memberships and even travel plans. 49. Always "Take Away" food. In many places on the menu you will see you two prices listed, one for take away and one for eat in. Double check the prices on the menu before you order. 50. Have fun! 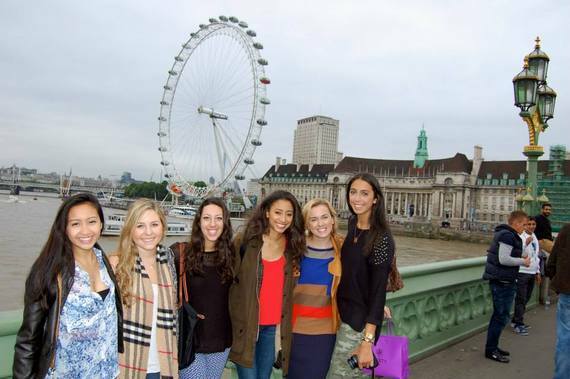 The best advice I could give anyone when studying abroad in London is have fun! Don't stress about how much money you spend, if a trip goes wrong or you start to miss home. All of these things are a part of the abroad experience and are necessary for growing into a more independent person. London will be the time of your life if you make the most of it! Looking for a hotel in London? Check here. Read more student travel stories at The College Tourist.